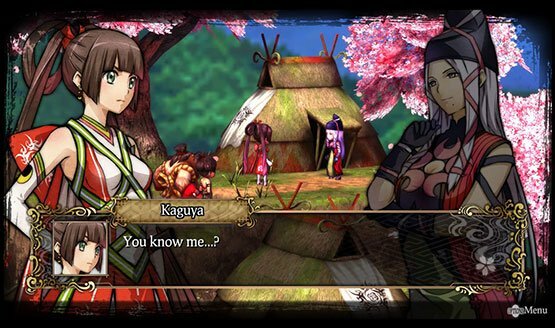 Simulation role-playing games, also known as tactical role-playing games in the west, are one of the more popular video game genres in Japan; and God Wars: Future Past is the latest SRPG to be developed by Japanese studio Kadokawa Games since it released Natural Doctrine back in 2014, the same year God Wars was original announced. But unlike Natural Doctrine, which attempted to revolutionize the genre, God Wars is a return to the basics of SRPGs. 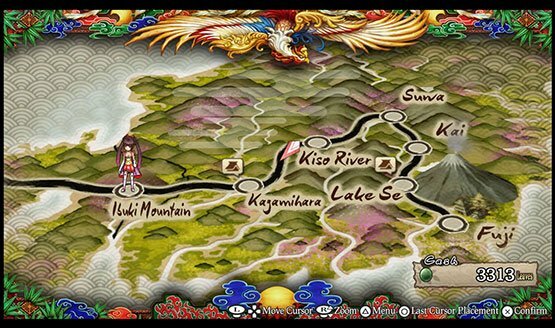 God Wars: Future Past takes place in the mythical land of Mizuho, which is composed the nations of Fuji, Izumo, and Hyuga, where humans and gods lived amongst each other in peace and harmony. But as the humans developed more technology and slowly became more dependent on them they slowly drifted away from the gods and conflicts began among humans along with the destruction of nature. This angered the gods which initiated a slew of natural disasters across all of Mizuho. In an effort to appease the gods and prevent the further destruction of the world, the Queen of the Fuji Nation Tsukuyomi sacrificed her second and most beloved daughter Sakuya to Mount Fuji. The queen also confined her youngest daughter Kaguya in case another sacrifice was needed. 13 years later, the queen has disappeared and Kaguya is rescued by her childhood friend Kintaro and his god companion Kuma. The trio then go out in search for Queen Tsukuyomi to seek answers. Throughout their journey, the trio meet a large variety of distinct and interesting characters, including several gods, some of which end up joining the party. Each of the game’s playable characters are pretty unique, each with their own personality and back story, and feature some interesting character designs. These are then backed up by a fully voiced cast which is incredibly impressive in spite some rough spots in the game’s dialogue. The visuals of God Wars are both impressive and disappointing. Its 2D visuals and animations, seen in its dialogue sequences and cinematics, are beautifully well-done. The usage of fully animated cinematics is also incredibly noteworthy in itself. On the other hand, the game’s 3D visuals, seen during combat and some dialogue sequences, look quite dated. While this is somewhat par for the course for games in the genre, other titles are able to handle its 3D visuals incredibly well which sadly isn’t the case for God Wars. In spite its dated visuals though, the battles in God Wars are definitely one of the game’s strengths. 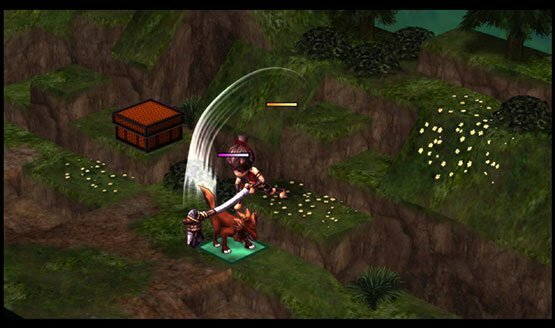 God Wars’ battles feature classic isometric turn-based SRPG gameplay which, when combined with the game’s character progression and customization systems, make for a deeply enjoyable experience. 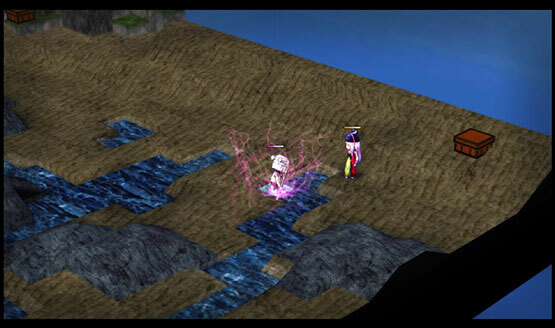 Characters take their turns depending on their speed and are able to move and perform one action each turn. Because of this, taking into account which characters or enemies go next and planning accordingly becomes incredibly important. Alongside classic SRPG tactics such as positioning characters behind or on the sides of enemies to do more damage and increase their chance to land attacks, God Wars’ battles also include vertical positioning bonuses and penalties; attacking from a higher point with melee weapons will deal more damage while ranged weapons and spells have increased ranged from higher points. On the other hand, being at a lower point will mean reduced damage. One interesting mechanic that God Wars features is Impurity levels. Taking actions in battle, such as attacking or healing, raises a character’s Impurity which increases the likelihood of enemies targeting them. There are also abilities that directly increase or decrease a character’s Impurity by a significant amount, such as a Warrior’s Taunt or a Priest’s Purification, respectively. Actively raising or lowering the Impurity of characters is pretty important for keeping incoming damage focused on tanks while keeping one’s squishier characters healthy. 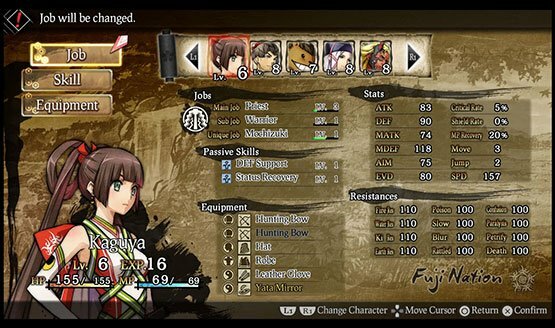 Apart from equipment, character progression in God Wars is centered around a deep job system. Characters can have two to three jobs at a time; a main job, a sub job, and a unique job. The main and sub jobs can be one of any of the eighteen available jobs, given that the character has unlocked the requirements for that job, while the third job is unique to each character and cannot be changed. Each job features a skill tree that can be advanced using Job Points which are gained by performing actions during battle. Each job earns Job Points separately and differently, with the main job earning points faster than the sub job. The job system allows players to experiment with different job combinations for each of the game’s playable characters. It also allows them to adjust or optimize their party for ensuing battles. Sadly though, the skills or abilities learned from a job cannot be accessed if that job isn’t one of the selected ones for the character. And with the sub job earning less points than the main job, farming for job points whenever a character is trying out a new job can either become slow or challenging depending on whether the new job is placed in the main or sub job slot. Luckily, the game has replaced randomized battles with a request system that allows players to accept missions that usually involve battles requiring players to defeat all of the enemies. This system allows players to grind job points whenever they want or need to or progress through the story uninterrupted if they don’t, which makes the game more accessible to newcomers while streamlining it for those with experience with the classic genre. God Wars also makes it somewhat easier for new players to learn the basics of the game via its tutorial dialogues which display helpful images with accompanying text. The first portion of the game is riddled with tutorial dialogues to make sure that players know and understand all of the game’s mechanics. While this is a great feature for those who are new to the genre, veteran SRPG players may find the tutorial dialogues unnecessary and having the option to turn them off and have them accessible in the menu would’ve been welcome additions. God Wars: Future Past takes classic SRPG gameplay mechanics and not only executes but also supplements them incredibly well. The game’s story and cast of characters make for a fascinating and entertaining experience that is matched only by the game’s enjoyable battles and deep character progression. The experience is then enhanced even further by the game’s beautiful 2D visuals and fully animated cutscenes. In spite its few flaws, SRPG fans will surely enjoy this latest outing by Kadokawa Games and newcomers who are able to take the genre’s traditionally slower pace may find themselves hooked. Review code for God Wars: Future Past provided by the publisher. Reviewed on PS4. For more information on scoring, please read our Review Policy here.